Concordia is one of four communities in Monroe on the list. New Jersey is one of those states that gets broken down into different regions, and those in the know understand that Central Jersey has its own personality. Living in the middle of the state is advantageous for active adults because it is close to Philadelphia and New York City. Retirees that are interested in Central NJ real estate have shown strong interest in community pages for this part of the state. Out of the 101 total, the five that got the most hits for 2018 are detailed below. Concordia is about an hour south from New York City and is smack-dab in the middle of everything that 55+ adults need for rewarding, low-maintenance lifestyles. Not only is it within walking distance from the Concordia Shopping Center, it is minutes from the New Jersey Turnpike. There is also a Costco in town, and the Freehold Raceway Mall is a 15-minute drive. One reason for Concordia’s high ranking on this list it its Concordia Golf Club, with its 18-hole course, driving range, and a restaurant. Club Concordia offers a top-notch fitness center, sauna, and an indoor pool and spa. 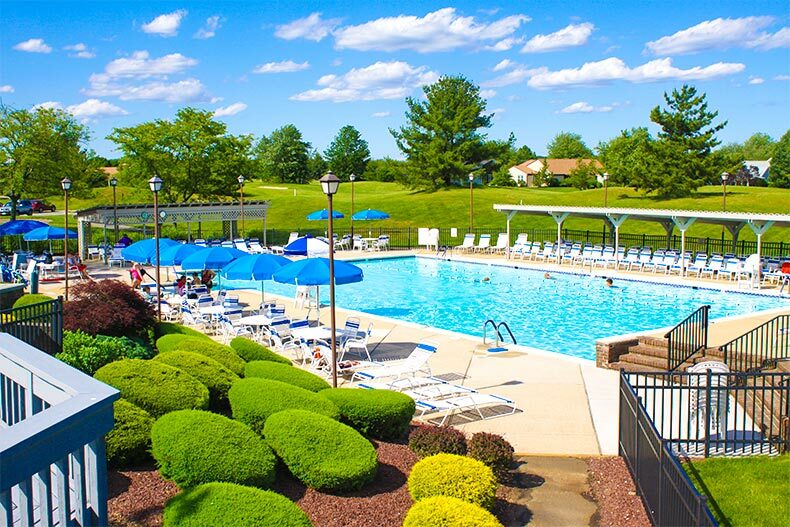 During the warmer seasons, residents can be found lounging by the outdoor pool, biking along the community trails, or playing bocce, shuffleboard, and tennis. There are also over two dozen activity groups that always welcome new members. This well-established, gated property has 1,757 condo, attached, and single family homes. Floor plans range from 951 to 1,700 square feet and have one or two bedrooms, one to two-and-a-half bathrooms, and carports, one-, or two-car garages. Just five minutes west of Concordia is Clearbrook, which has some similarities to its predecessor. It is also in Monroe, so homeowners have that same easy access to shopping, restaurants, and the Turnpike. Both of these 55+ neighborhoods are near excellent hospitals, including Robert Wood Johnson in nearby New Brunswick and the highly rated Penn Medicine Princeton Health. Clearbrook’s outdoor amenities also feature a lovely pool, bocce, trails, tennis, pickleball, and an amphitheater. The state-of-the-art, 25,000 square-foot clubhouse has art studios, a ballroom, a fitness center, and its own health center. Some of the most well-liked activities here include the Jewish War Veterans group, Qi Gong, the singles group, golf club, and jewelry workshops. This established community has over 2,000 condo, attached, and single family homes. The models range from 520 to 1,730 square feet, with one or two bedrooms, one to two-and-a-half bathrooms, and assigned parking, carports or attached garages. Coming in at No. 3, Rossmoor Village is another one of Monroe Township’s 13 active adult neighborhoods. It is a well-established, gated community with 2,303 condo, attached, and single family homes on 418 acres in Middlesex County. Rossmoor Golf Course is a par 72, 18-hole course that offers discounted membership rates to Rossmoor homeowners. The lively community clubhouse sponsors ongoing events like live musical performances, current events roundtables, pinochle, hiking groups, yoga, and Zumba. It also has activity rooms, a ballroom, and a photography studio. Outdoors, you will find the outdoor pool and sundeck, plus bocce, tennis courts, and R.V. parking. There are dozens of condo and attached home floor plans offered, ranging from 590 to 2,063 feet. These offer one to two bedrooms, one to two baths, and carport parking. There are also some single-family options ranging from 1,200 to 2,250 square feet. These have two bedrooms and two or two-and-a-half baths, and either a garage or carport. This is the only community on this list that is not in Monroe, but it is only about 11 miles west. Also affordable, Covered Bridge has 1,557 condo and attached resale homes located right by Pine Brook Golf Course. Covered Bridge also scores high on community amenities with two clubhouses, each with its own exercise room. Additional perks include a sauna, a performance theater, gardening plots, horseshoe pits, tennis, bocce, and a relaxing outdoor pool. There are activity groups for every interest, including movie trivia, bus trips, the Covered Bridge Singers, creative writing, and meditation. The majority of the homes here are condos. They come in six floor plans ranging from 978 to 1,130 square feet, with two bedrooms, two bathrooms, and assigned parking spots. There's also a select number of one-story townhomes which have two bedrooms, two bathrooms, and a parking spot in front. Rounding out our list is Greenbriar Stonebridge, which began construction in 2006, making it one of the newest communities on the list. It hosts 946 single-family and attached homes. Amenities on offer center around the 41,000 square-foot clubhouse. It's home to a state-of-the-art fitness center, indoor lap pool, aerobics studio, and several hobby rooms. Residents also enjoy The Spa at Stonebridge, a resort-style pool, tennis and bocce courts, and walking trails. There are dozens of home models to interest prospective buyers. They range from 1,659 to 3,130 square feet and have two or three bedrooms, two to three bathrooms, and one- or two-car garages.